It has happened a few times that an unscrupulous person has attempted to "sell" a porcelain ball-jointed doll they do not actually own, usually on eBay. Unfortunately, as the work of these talented artists (and the accompanying price tag) becomes more well-known, there will probably be more of this. As well informed fans, we have the power to STOP this activity. If you see an auction or sale that looks suspicious, please post a link here and we will investigate and, if necessary, report it. This thread serve to inform us of suspicious activity, curb it, and provide a permanent record of who the scammers are. The scammers use many aliases but if their efforts are not successful they will give up. No one of these things necessarily means a sale or auction is a scam, but if there are several of them, the listing is suspicious and deserves investigation. 2. Click "Report this Item." It's in the left margin right above the listing discription. 4. Ebay will investigate. They are most likely to investigate if more people report the item. 5. Please also take a screenshot of the listing for our records, since eBay will take the listing down. You can also report by phone. -take your own photos of the doll you are selling, with a paper where you have written your username and the date (this proves you took the photo). 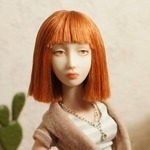 -It's usually fine to use artist photos or a previous owner's photos as well as long as they are of the exact doll you are selling and you have a "proof" photo. Reporting fraudulent auctions is very effective! Ebay does indeed listen to those reports and so far all auctions with suspicious activity have been taken down. Doll being "sold": Red-headed Rubanesque Enchanted Doll with accessories. Case Summary & Notes: This person purported to be selling a Rubanesque porcelain doll, with a starting bid of $200. They used only Marina's photos and all the text was copied from Marina's blog. The shipping price was also suspiciously low at $6. Case Summary & Notes: This scam appears identical to two previous ones. This person claimed to be selling Elena the Beautiful with crown, shoes, and fur stole. Community records indicate these items were split in a previous sale & the crown is currently owned by lilithskyblu. Seller had a $9 starting bid with no reserve and free shipping. The seller had zero feedback. They stole photos from Angelificatu. The auction was reported almost immediately and taken down 2 days later. This seller tried to sell another type of rare doll; that auction was also taken down. Case Summary & Notes: This scam appears identical to a previous one. The starting bid was $9, the seller had zero feedback and used a community member's photos. The doll being "sold" was owned by pinktink at the time. The listing was removed within a day. Case Summary & Notes: The seller claimed to be selling Elena the Beautiful, who was owned buy a community member at the time. Case Summary & Notes: The seller claimed to be selling Appolina Plague Doctor by Ekaterina Skorvka, but this doll is still in the artist's possession. The seller had good feedback on unrelated fossil sales. The seller used the artist's photos.